Ion beam figuring (IBF) is a high-end method of correcting errors on an optical surface. This process is also known as “corrective polishing”. It can achieve depth precisions of a few nanometers and local resolutions accurate to within millimeters. Other methods include “small tool polishing” (SMT), fluid jet polishing and magneto-rheological figuring (MRF). These methods are sometimes listed under finishing rather than figuring, as they generally represent the final correction stage of an optical surface. Due to the high level of precision achievable, ion beam figuring (IBF) is very well suited for this last processing step. Depending on the product and technology, this step may be followed by further coating processes for optical surfaces. IBF is a contactless process, making it perfect for optical production. Accelerated argon ions ablate minuscule particles on the surface of the workpiece. The intensity of the ablation is controlled via the dwell time at the affected position on the workpiece. Errors during processing therefore have much less influence on the resulting surface. The roughness value of the surface remains unchanged for most materials. In some cases, such as quartz glass and silicon, it can even be improved Another advantage of IBF is that it can process workpieces even beyond the edge (such as optical lenses of mirrors). This increases the clear aperture. The process also does not cause new damage to the surface. Ion beam figuring is a purely physical procedure. No chemical reaction takes place (in standard IBF). A beam of heavily accelerated ions strikes the workpiece with sufficient kinetic energy (around 1 keV), and transfers its energy to the atoms on the surface. The atoms can no longer hold themselves together and are gasified. In other words, they are atomized, leading to the term “sputtering”. This process is also known as “dry etching”. Argon is typically used as the ion source. What can be processed with ion beams? 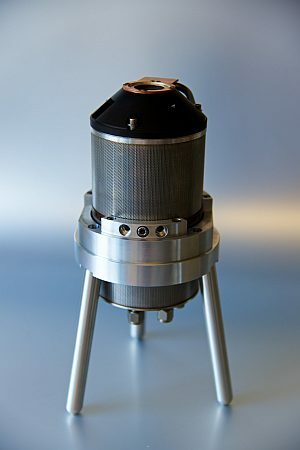 Any material that is vacuum compatible is suitable for ion beam figuring. A low sputter yield is applied for soft materials. IBF is also suitable for special glasses made from salts such as sodium chloride, which would simply dissolve in the “wet” processes like MRF or fluid jet polishing. OPTEG’s OMF range of products is designed for workpieces with diameters of 5 mm to 1.2 m. Larger or smaller diameters are also possible. The customer informs us of the task for which a technical solution is required and we develop that solution.